The special opportunity to play your way into more Five Tool events is offered this summer with qualifying events. It’s simple, for nine selected events, if your team wins, you receive a paid entry to another Five Tool event. This also includes the opportunity to play in limited events such as the Five Tool Show and Five Tool Texas 17U Championship by winning the Five Tool Texas DFW Kickoff and Five Tool Central Kings of the Ozarks Qualifier, respectively. Five Tool is also offering the opportunity for two teams earn a bid to play in the AABC Connie Mack World Series in Farmington, NM. On June 12-17 in Houston, TX, the Five Tool AABC World Series Qualifier takes place. And on July 25-29 in Albuquerque, NM, the Five Tool West AABC Connie Mack Last Chance Qualifier takes place. 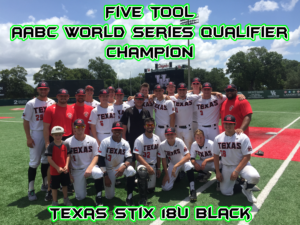 In 2017, Five Tool sent the Texas Stix, based out of Dallas-Fort Worth, to Farmington after they won the 2017 Five Tool AABC World Series Qualifier. See below for the full list of Five Tool qualifying events with registration. Winner of each age group receives free paid entry into 2018 Five Tool Midwest Oklahoma WS (July 11-15). Register. Winner receives paid entry into the Five Tool Show (June 21). Register. Winner receives $1500 credit towards the Five Tool Texas 17U Championship (July 11-14). Register. Winning team receives a $10,000 travel stipend for the Connie Mack World Series. Register. Winner receivers paid entry to the Five Tool Texas 17U Championship (July 11-14) or credit towards a select Five Tool Central event in 2019. Register. Winners receive paid entry into Five Tool 2018 Midwest Championships (July 4-8). Register. Winner program receives paid entry into Five Tool West Southern California Summer Finale (August 2-5). Register. 15U, 16U and 17U winners receive a free paid entry into the 2018 Five Tool Texas World Series (July 25-29). Register. 14U, 16U and 18U winners receive a free paid entry into the 2018 Five Tool Texas World Series (July 25-29). Register. Winner receives a bid to the Connie Mack World Series. Register.